Posted March 1, 2001 by Josette Farrell in News. Tá sé ráite le gairid (ag Eamon Ó Cuív), go mbeidh deireadh leis an nGaeltacht, mar ata sí faoi láthair, taobh istigh de ghlúin amhain. Is soiléir go bhfuil an méid Gaeilge a labhraitear sa Ghaeltacht ag laghdu. B’fhéidir nach bhfuil fhios ag a lán daoine sa cheantar seo, go bhfuil conaí acu sa Ghaeltacht, no sa Bhreacghaeltacht, is go bhfuil go leor Gaeilge taobh timpeall. Ta cainteoirí o dhúchais anseo is ansúid, agus Gaeilge breá liofa acu. Cloistear iad uaireanta sa phub no sa siopa. Ta trí naonraí sa pharóiste, is tá caighdean árd Gaeilge labhartha sna mBunscoileanna freisin. Cinnte, tá a lan Gaeilge ag na leanaí thart timpeall. Tabhair seans dóibh an Gaeilge sin a úsaid sa bhaile, i sli déas nadurtha. Labhair leo as Gaeilge. Bhí cruinniu i gCairn Mór, idir Coimisiun an Gaeltachta agus muintir na háite ar 6ú Feabhra. Tá an Coimisiún faoi lathair ag féachaint ar gach uile ghne de shaol na Gaeltachta, o ról Udarás na Gaeltachta go seirbhís stáit, o ról TG4 go deontais labhartha Gaeilge. Beidh an Coimisiun ag cur sraith moltaí os comhair an Rialtas, maidir le cur chuige nua a chuideoidh le buanu na Gaeilge sa Ghaeltacht. Tá siad ag iarraidh fáil amach ceard a cheapann muintir an Ghaeltacht faoi chursaí Gaeilge sa Ghaeltacht inniu, agus ceard iad na hathruithe ata le déanamh chun todchai na Ghaeltachta a chinntiú. Tá ceistneoir le fáil. Is féidir leat í a líonadh agus a sheoladh chuig Comisiún na Gaeltachta. Tá suim acusan i do thuairimi, agus aon moltai a bhfuil agat. Cén ceantar Gaeltachta ina bhfuil tú I do chónaí, má tá cónaí ort sa Ghaeltacht? An gceapann tú gur chóir go mbeach do chantar sa Ghaeltacht oifigiúil? Cén leas duitse nó dod theaghlach a dhéanfadh an Ghaeltacht a choinneáil beo? Cén bealach, dar leatsa, a mairfidh an Ghaelige mar theanga phobail sa Ghaeltacht? Cén chaoi is fearr, dar leat, le hóige na Gaeltachta a choinneáil ag úsáid na Gaeilge mar a rogha teanga? Cén leasú a d’fhéadfaí a dhéanamh ar oideachas Gaeltachta le go gcuideodh sé níos fearr le neartú na Gaeilge? Cé na moltaí atá agat do ról Udaras na Gaeltachta? Cé na moltaí atá agat do ról Raidió na Gaeltachta agus TG4 sa Ghaeltacht? Cé na moltaí atá agat do ról an Roinn Ealaíon, Oidhreachta, Gaeltachta agus Oileán? Cén tíonchar, dar leat, atá ag seirbhísí an Stáit sa Ghaeltacht ar úsáid na Gaeilge mar theanga pobail? Scríobh síos na tuairimí agus aon mholtaí eile atá agat a chuideodh le Coimisiún na Gaeltachta. In which Gaeltacht region, if any, do you live? In your opinion should the region be classified as an official Gaeltacht? How would the continued survival of the Gaeltacht benefit you or your family? How, in your opinion, will the Irish language survive as the everyday language of the Gaeltacht? 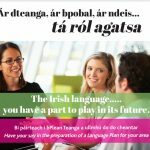 What, in your opinion, is the best way to ensure that the youth of the Gaeltacht use Irish as their language of choice? How could the education system in the Gaeltacht be modified so as to ensure that it promotes and sustains the use of the Irish language? What are your proposals with regard to the role of Údarás na Gaeltachta? What are your suggestions with regard to the role of Raidió na Gaeltachta and TG4 in the Gaeltacht? Do you have recommendations with regard to the role of the Department of Arts, Heritage, Gaeltacht and the Islands? 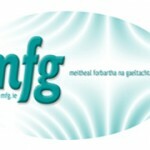 What effect, in your opinion, do State services in the Gaeltacht have on the usage of the Irish language there? Write down any opinions and/or recommendations you may have that you feel would help Coimisiún na Gaeltachta in their work? Fograíocht le haghaidh Meitheal Forbartha na Gaeltachta Teo.